What made you decide to stay at the Westin Resort & Spa? My husband travels for work, and has Starwood Preferred Guest (SPG) points and status. So when we travel, we’ll often start our accommodation search with Starwood properties. Thanks to his Platinum status, we booked a regular room with points, and received a free upgrade to a Royal Beach Club room after our first night, as it became available. Which was great – being in the Royal Beach Club, billed by Westin as a "resort within a resort", totally enhanced our experience. We considered renting an AirBNB in order to have a larger place with separate rooms for sleeping, but ultimately we wanted a relaxing beach vacation – and having to shop and cook meals, and schlep ourselves and all our stuff to the beach didn’t feel relaxing, so we went for the resort experience, with no regrets. Tell us the top things about the room. Location, location, location. The room had sliding glass doors that open onto our own giant ground level terrace, steps from the pool as well as the beach. Being that close to the pool and beach is key with a baby – naps, feedings and diaper changes are frequent; being able to walk a few steps rather than take elevators and walk down long lobbies made things much more relaxed, and maximized outdoor time. The giant terrace made our stay a true vacation. Without it, we would have been cooped up in a dark room with the baby once she went to sleep, whether for naps or at night. With the patio, we were able to dine and enjoy a beverage al fresco; listen to the waves roll in; and talk above a whisper. Plus ground floor means (unlike a balcony) that we could have room service delivered, or one of us could walk to grab dinner from one of the restaurants, without going through the room once baby was asleep. Did you find being on the ground floor noisy? We really didn't. I think because the Royal Beach Club is a small "resort within a resort", there weren't a lot of folks around. Plus, in general, the folks looking to stay at the Westin Resort & Spa Cancun were seeking a low-key and quiet vacation. One evening, a extended family sat around the pool chatting until about 9:30pm while their kids ran around the grass, but that really was the loudest it got. Pretty tame by Cancun standards. What did you think of the property? The Royal Beach Club is in its own smaller building within the resort, with its own pool, whirlpool, palapas and restaurant (breakfast, lunch and happy hour only). So even if you don't book a ground floor terrace, you could be out of your room and down to all amenities within a minute. The Club also has its own private check-in, which really speeds things up - great when travelling with a baby. The Westin is near one end of the end of the beach within the hotel zone, which distances it from the party scene. Perhaps a downside for singles, but a real advantage for us folks with babies who would give their right foot for a good night sleep. The Royal Beach Club is at the far end of the Westin property, meaning it's even quieter beachfront. Of course, staying within the Royal Beach Club doesn't mean you can't make use of all the larger pools, restaurants, fitness center or spa in the main resort. We are vegetarian, so we found variety to be a bit of a challenge, especially with lunch and dinner. But my husband is good at ordering off menu, and the staff were accommodating. The quality of what we did eat was good. Did you partake in any of the Westin Resort & Spa Cancun's activities or amenities? I did get a massage in the spa, which was a wonderful and relaxing treat for my worn down body! I chose to have the massage in a cabana on the rooftop, just outside the spa. That way I could hear the ocean, while having more privacy than the beachfront cabanas. I was disappointed that this resort doesn't offer any yoga classes. One of my favorite activities on a beach vacation is yoga overlooking the ocean. And while other Westin properties offer group runs, this resort didn't. Since there were no yoga classes, I ended up going to the gym, which was clean and had new equipment. Any downsides to the room or property? I was disappointed by the lack of yoga classes, which I just mentioned. The crib looked like something out of a 1940’s orphanage. The sides were incredibly tall – good for safety I suppose, but awful for getting a baby in and out of the crib. It seemed like every time the baby rolled over and found herself against the cold metal bars, she’d wake up crying. I admit that my kid is a bit of a “princess and the pea”, and a tough sleeper, but the crib did nothing to help us. Any suggestions to other families travelling with a baby to this property? Book a room within the Royal Beach Club. The cost is only marginally more than a room in the main resort, but its small scale is ideal for families travelling with a baby. The distance between your room and the beach, pool and restaurant will all be much smaller - which you'll appreciate during the many trips back and forth you'll undoubtedly make with a baby and all its baby gear in tow. Make sure you reserve a Balcony or Royal Beach Club room, so that at minimum you have a balcony that you can enjoy while your baby is sleeping. Then call the resort, and request a ground floor terrace room - being able to walk straight out to the pool and beach is an amazing luxury, and the terraces are huge, which is great since it'll essentially be your living space in the evenings while your baby is sleeping. Also make sure you request a crib in advance, so that it's set up in your room at arrival. If you think your baby will need a crib upgrade, you can rent a crib for $72 USD/ week through a Cancun based rental company. Hire a babysitter – even if you don’t plan to spend much time apart from your baby. We hired a sitter, and it turned our trip into a vacation (or the closest thing to a vacation that a new parent can hope to experience!). 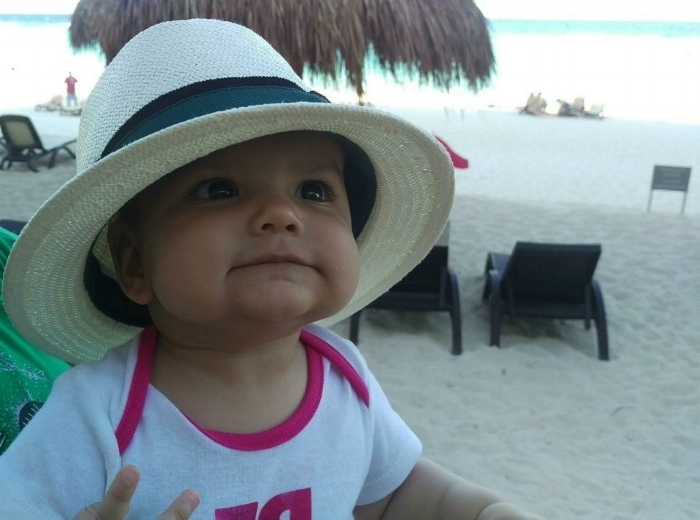 The Westin Resort & Spa Cancun does not offer a babysitting service, but a quick online search provided a number of reputable options. And if you plan to use the spa, don't book directly with the spa. The employees walk around the pool chairs and palapas every morning to sell the spa's services, and you can get discounted spa services this way.